Tell us a little bit (or a lot) of your story. When/how did you meet? How long have you been married? What do you do for a living? Tell us all of the things! We first "met" when I (Sarah) heard Tim speak at a campus ministry event in college. Hearing him speak and talk about his story, I instantly knew we would be great together... I actually called my dad that night and told him I had found the guy I wanted to marry! Tim was a senior in college at the time and I was a freshman, so I didn't go talk to him but I started working on other ways for us to meet :) Both of our dads are college football coaches and were accquaitances at the time, so I relied on them and their mutual friends to help make the connection. Once we finally met in person (almost a year later!) we connected immediately, and were engaged 7 months later! We have been married for 8 years and have lived in both Florida and Chicago. Tim is a pastor at our local church, and I'm the area director for a nonprofit on the North Shore of Chicago (where we live now!) called Young Life. 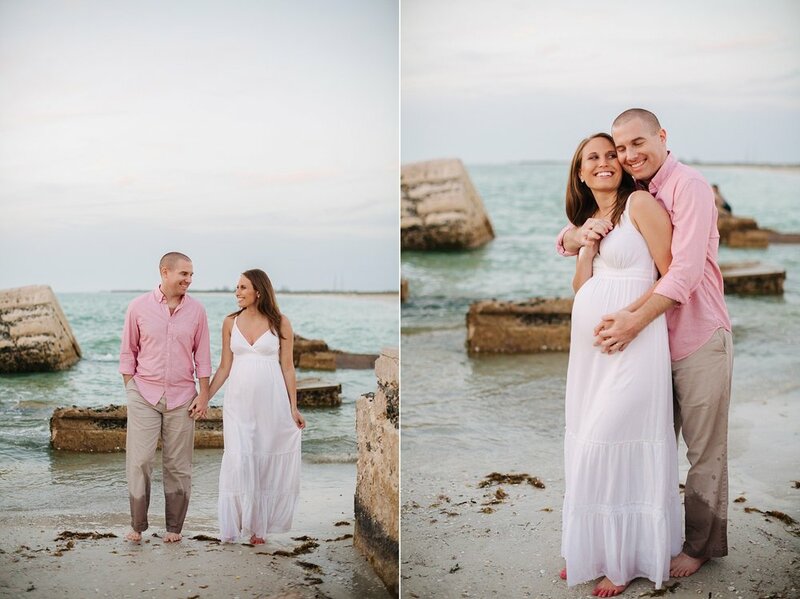 Something that is a huge part of our story- and part of why this maternity shoot was so special for us- is that we went through almost 2 years of infertility before I was able to get pregnant. We had a lot of hard days when we really thought we would never be pregnant, so this baby is truly a miracle and answered prayer for us! Do you have a name picked out for your baby? If so, what is it and why did you pick it? We did have a name picked out!! At the time of the photo shoot, we thought we were having a girl and we had picked out a name we loved. But just two days ago I was at the doctor and they decided to do a sonogram to check on something (everything with baby is okay thankfully!) and we found out the baby is a BOY! We are definitely adjusting to having a son and are so excited, but we hadn't talked about boy names at all since we "found out" we were having a girl so early on. We definitely have to scramble these next 7 weeks to pick one out! What are you most looking forward to with your growing family? We are looking forward to so many things! We can't wait to meet our son and get to know his personality. We are so excited to find out what he's interested in and what he's passionate about so we can help him flourish in those areas. We want to help him learn what it means to love God and love others, and we feel like it's crazy we get to have such an awesome honor as parents. We are so excited to make memories together as a family, and we want to raise our son so that he knows he is loved, treasured, and valued by his parents! These two! Such amazing, precious, wonderful people! We were so excited when Molly asked us to do this session for them. It is one of our favorite things to be able continue telling our couple's stories. We photographed Preston & Molly's wedding at The Powel Crosley Estate back in September 2014 and their engagement session (which will forever be a favorite) that summer. It will be 2 years this September. We met at Fossil where we both worked. According to Preston he was minding his own business trying to sell watches and in walked the girl of his dreams. I didn't believe in love at first sight until I met Preston. Ultimately his personality is what sealed the deal! Molly describes Preston: Funny, Loving, Down to earth, Loyal, and Handsome. Preston describes Molly: Lovable, Beautiful, Passionate, Caring, and Creative. Describe an ideal day together. Our ideal day is when we have the entire day to spend together. We love being active and spending time outdoors; going to the beach, taking long walks and playing tennis. Our nights usually end at home on the couch watching a movie and eating ice cream. Ready to make this happen?